How to select the right Visor for your Motorcycle Helmet? Motorcycle helmets have become an important part of owning a motorcycle due to the role they play in keeping the driver safe and secure. With that has evolved the option to add features to them and customize them to the way that you want, with these additional features improving your experience when driving your motorcycle. One such feature is to add a motorcycle helmet visor to your helmet. There are a number of differences you can get with your helmet visor. But you might be asking yourself why you would want a motorcycle helmet visor or what purpose it actually has. That reason is specified further on in the next section. Why do I want a motorcycle helmet visor? Most motorcycle helmets should already come with a helmet visor, if yours is the style that supports one however there can be some that require you to purchase one to attach to it or ones that are mainly for protecting your head and do not have any helmet visors at all. Most racing style helmets should however have a motorcycle helmet visor. There are certain features that are crucial to the use of a motorcycle helmet visor and ones that you should remember to pay close attention to as some directly link into safety. Safety should remain the most important factor when assessing adjustments to a helmet, as it is your life being protected by these pieces of equipment. What features for I want in my motorcycle helmet visor? If you intend on maintaining high speeds or using the freeway for travel then you will definitely want a motorcycle helmet that is capable of installing a visor. Some motorcycle helmets do not have visors however these are mainly for slower speeds such as city commuting and not for long distances. The effectiveness of the eye protection should be enough that it protects your eyes from the wind when you’re travelling at high speeds as well as debris that may hit you such as bugs, dirt, stones and other hazards. The material should be thick enough to withstand a significant hit and not be too fragile or crack when struck. Additionally you may want to get a visor, which has some form of UV protection if you’re expecting that you will be riding out in the sun a lot. Protection of your eyes is more than just physical protection, but also protection of longevity. The UV protection should keep you safe from the sun’s rays the same as a pair of sunglasses would. Head protection is also a key component when selecting the best motorcycle helmet visor, as you do not want the visor to inhibit the ability of the helmet to protect our delicate skull. If the visor does prevent you from putting your helmet on properly or has the potential to damage it then it is recommended you find another visor immediately. Once again, accessibility can be directly linked into the safety aspects of the helmet and the visor. You never know when there may be a situation in which you’ll need to adjust your visor or flip it up. Having a visor that is stiff and hard to adjust could cause problems in such a situation and is one you do not want to have. The style of the motorcycle helmet visor should be considered after you have taken to account all the previously mentioned details. Choosing a style is exciting, but not essential. It is possible to find a variety of different styles to suit your likes when you search around, where you can theme it uniquely to your preferences. The color of the visor is another small aspect. It mainly comes down to whether or not you want consistency with your helmet and visor. If you have a colored helmet you may want to consider purchasing a visor that is a similar color or tinted to a similar color to get that match and consistency. Key Takeaway: You will also want to ensure that the visor is the right fit for your helmet and can be attached without any damage which could be in the form of cracking, stretching or even damage to your helmet. A visor that does not fit would limit its ability to protect you and also inhibit the safety factors mentioned previously. What are some good motorcycle helmet visors? This motorcycle helmet visor is one of the smaller ones aimed at only covering the eyes in a similar design to the way a pair of goggles would. This visor eliminates the need for a separate pair of goggles on your helmet and works very well as an attachment for bowl shaped helmets that do not have a visor pre-installed. 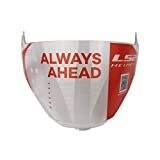 This replacement motorcycle helmet visor is excellent for making a change in a racing helmet’s visor for whatever reason. It is also relatively cheap and still manages to meet all the requirements previously listed of what you should look for in a visor, where it provides adequate protection to your eyes and is durable to hazards. Item is not compatible with Pinlock system. Another variant of the racing helmet style visor, this one has additional features in the form of a mirror-coated face shield. One of the main benefits this does is that it reduces the glare you get from the sun as well as prevents people from seeing into your helmet, useful if you’re shy or don’t particularly like being stared at. Finding the best motorcycle helmet visor does not have to be a challenge but should always be done with safety in mind. Operating any motor vehicle can be dangerous so it is always important to ensure that your safety comes first before anything else, so that you may enjoy all the wonders of motorcycle riding.